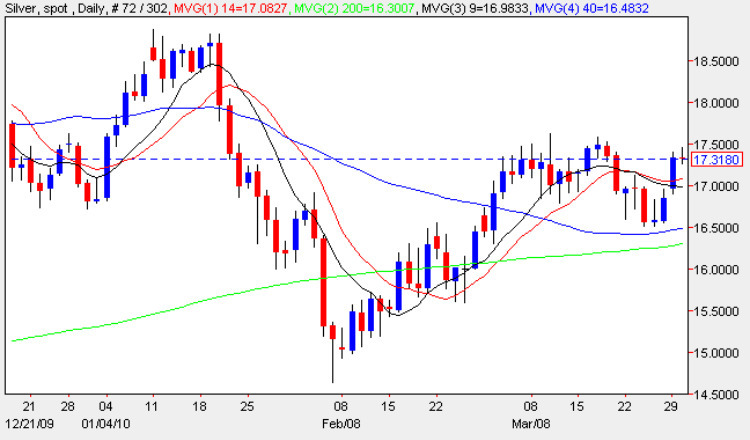 An interesting day for silver prices yesterday which finally managed to break out of the recent sideways price action which has seen the commodity trade in an envelope between the 9 and 14 day moving averages above and the 40 and 200 day below. The trading session ended on a wide spread up bar which closed marginally below the key $17.50 per ounce level with good support to the body of the candle from the 9 day moving average. The recent rally in silver from early February is in sharp contrast to that of gold which has continued to consolidate sideways since its breakout of late 2009 and indeed the traditional correlation between these two precious metals appears to have broken down in the past few months. Whilst spot silver remains mildly bullish gold continues to adopt a bearish tone with the latter trading in a relatively narrow channel. Part of the reason for the recent recovery in spot silver is due to the performance of equities with a continued appetite for risk fuelling demand for silver as an industrial commodity. A break and hold above $17.50 should provide the requisite platform for a sustained move to re-test the $18.50 price handle in due course where silver prices stalled the last time around. Any break above this region could open the way to a longer term run towards $21.00 per ounce and above by the end of 2010.